1 Offer subject to credit approval. If at the time of your application you do not meet the credit criteria previously established for this offer, or the income you report is insufficient based on your obligations, we may not be able to open an account for you. This offer is available to new cardmembers only. The annual fee will automatically bill to your account within 6 weeks after approval of your application. For information about rates, fees, the annual fee, other costs, the reward program and benefits associated with the use of the credit card program, please see the Terms and Conditions. Annual Fee: $89. 0% introductory APR on balance transfers made within 45 days of account opening is applicable for the first 15 billing cycles that immediately follow each balance transfer. This introductory APR offer does not apply to purchases and cash advances. For purchases and new and outstanding balance transfers after the introductory period, the variable APR is 18.24% or 27.24% depending upon our review of your application and your credit history at account opening. The variable APR for cash advances is 27.49%. The APRs on your account will vary with the market based on the Prime Rate and are subject to change. For more information see the "About the Variable APRs on Your Account" section of the Terms and Conditions. The minimum monthly interest charge will be $0.50. Balance transfer fee: 3% (min. $5). Cash advance and cash equivalent fees: 5% (min. $10). Foreign transaction fee: 0%. See Terms and Conditions for updates and more information about the terms of this offer. The annual fee will be waived for Senator and HON Circle Members, as long as they maintain their Senator or HON Circle Member status. The personal Miles & More service card number of the primary applicant is required within the application process. If you are not already a Miles & More member, please click here to enroll. 2 Please click here to review the Rewards Summary for important information about the award miles accrual and other reward benefits of the World Elite Mastercard. Award miles require payment of the annual fee. Miles & More integrated airline partners are: Adria Airways, AirDolomiti, Austrian Airlines Group, Brussels Airlines, Croatia Airlines, LOT Polish Airlines, Lufthansa, Luxair and SWISS. Lufthansa Business Lounge Voucher: The primary cardmember is eligible to receive two (2) one-time use Lufthansa Business Lounge Vouchers (the Lounge Vouchers) upon the first use of the account for a Purchase. Each year thereafter, the primary cardmember is eligible for the Lounge Vouchers provided the account remains open and in good standing for at least 45 days after payment of the annual fee. Each Lounge Voucher is valid for one (1) cardmember or one (1) travel companion for one (1) visit at Lufthansa Business Lounges worldwide. Each Lounge Voucher will be valid for 12 months from the date of issuance to the cardmember's personal Miles & More account in "My in-box". Please allow 2 weeks after qualifications have been met for delivery of Lounge Vouchers. Miles & More is solely responsible for the electronic delivery of the Lounge Vouchers to the cardmember's personal Miles & More account in "My in-box". Companion Ticket: The primary cardmember is eligible for an Economy Class Companion Ticket upon the first use of the new account for a Purchase and on the account opening anniversary every year thereafter provided the account remains open and in good standing . Reservations must be made by calling Miles & More Companion Ticket Service at 1-866-461-5399. Please note that all taxes and fees must be paid for the revenue ticket as well as the Companion Ticket. (Companion portion is only the airfare.) This offer may not be combined or used in conjunction with any other promotion, discount, add-ons or coupons and is not combinable with child, infant or senior citizen fares, travel agent discounts, other promotional offers, group fares, frequent flyer awards or special credit vouchers. Please visit www.lufthansa-usa.com/companion for full Companion Terms and Conditions. Status Miles Conversion: The primary cardmember is eligible to convert a minimum of 5,000 award miles up to a maximum of 25,000 award miles into status miles at a ratio of 5:1 upon the first use of the account for a Purchase. Status miles are used for achieving or maintaining a given Miles & More members status (note that HON Circle miles are excluded). Each calendar year thereafter, the primary cardmember will qualify for this benefit provided the account remains open and in good standing for at least 45 days after payment of the annual fee. Only award miles that have been earned for retail Purchases with the World Elite Mastercard (that are not later returned or rescinded) in the current and preceding calendar year are allowed for conversion into status miles. One conversion event per calendar year is permitted and the conversion is non-reversible. The conversion into status miles is available online at www.miles-and-more.com after login to your personal Miles & More account. Please allow 2 weeks after qualifications have been met for the conversion to be activated. Up to 15% off Hotel & Car Awards: The discount for 15% off on Miles & More Hotels and Miles & More Cars is only valid for the primary Miles & More World Elite Mastercard cardmember and can only be applied to bookings made via Miles & More Hotels (miles-and-more.com/en/hotels) and Miles & More Cars (miles-and-more.com/en/cars). To receive the discount, please visit Miles & More Hotels and Miles & More Cars via the links stated above and select your hotel or car award. The discount will automatically be applied after logging in. Neither cash nor an account credit of the discount is possible. Miles & More award flights: Amounts shown based on Economy Class round-trip flight awards for direct travel on Star Alliance member airlines from the U.S.. Taxes and fees are not included in the flight award. Taxes, fees and carrier charges may apply. For details on the Miles & More program and redemption opportunities please visit www.miles-and-more.com. 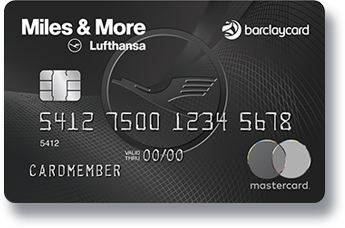 The Miles & More World Elite Mastercard is issued by Barclays Bank Delaware pursuant to a license by Mastercard International Incorporated. Mastercard and World Elite Mastercard are registered trademarks, and the circles design is a trademark of Mastercard International Incorporated. © 2019 Barclays Bank Delaware (Barclays), P.O. Box 8801, Wilmington, DE 19801, Member FDIC.